I went to nine schools throughout my academic career, moved houses 13 times, I work at one of the Big 4 accounting firms as a management consultant (which, besides having an incredibly high employee turnover, the nature of our jobs is that we do short term projects). Permanence is not a concept I am familiar with. 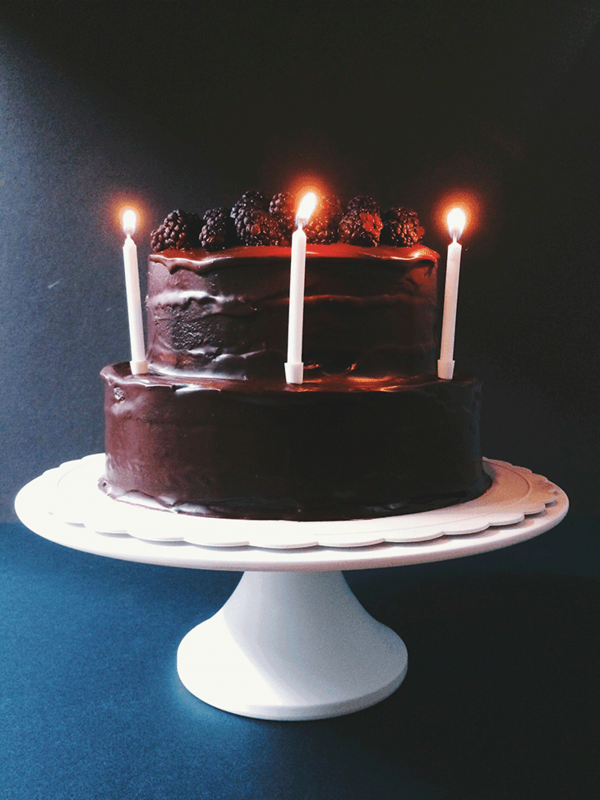 So to be celebrating my third year of baking and writing this blog is kind of a B.F.D. The past three years have seen quite a lot of changes in my life, my baking, and my work. I like to think I’ve grown and that writing here has helped me grow up and get to know myself a bit more… Imagine that, internalising through broadcasting my thoughts and other stuff out there. As a result of Ellebug (or The Happy Hufflepuff as we began so humbly three years ago), the work I’ve been doing, and the people I’ve met and become close to, I’ve built a strong appreciation for the art of reflection in the course of self discovery. I still have a long way to go, but it’s nice to have these handy tricks and tools to help me cope with feelings of stress and the occasional unprovoked discontentment that many of my fellow Gen Ys suffer from. Right now, where I am… there are a few big decisions that I will have to make over the next year, sort of the big ones to take me through the last few years of my twenties. Hard to believe when I started this thing that I was in a different age bracket. Goshdarnit. Okay, enough wallowing and vague sharing, let’s get down to business to defeat the Huns. I saw this recipe in my favourite food magazine, Delicious UK last year and knew that it would be THE cake I’m baking for my three year blog anniversary. Eric Lanlard’s epic celebration chocolate cake may have a longer list of ingredients than I usually prefer, but ooooh baby, was this cake worth it! I’m definitely going to be making this cake again, though in future I may substitute the butter icing filling with something more tangy. 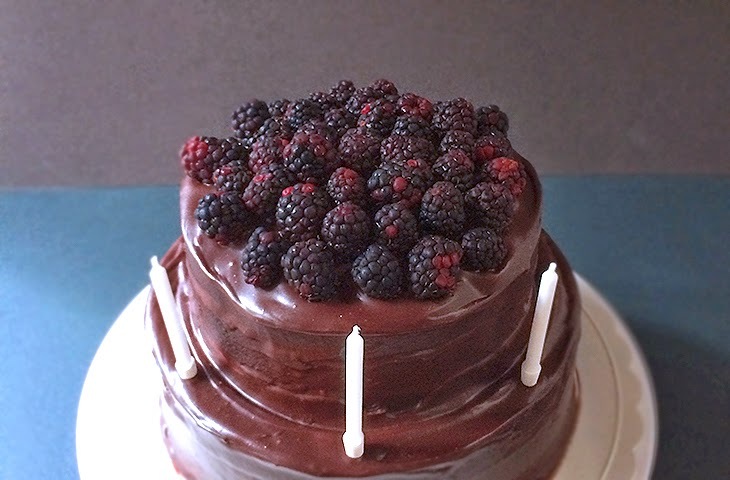 This cake was also the perfect one to go with cos it showcases my three favourite things: chocolate, ganache frosting, and berries. And to make it extra special, I used only the best Lindt dark chocolate (75% single source) for the cake, the butter icing, and the chocolate ganache. It’s ok to splurge every now and then. 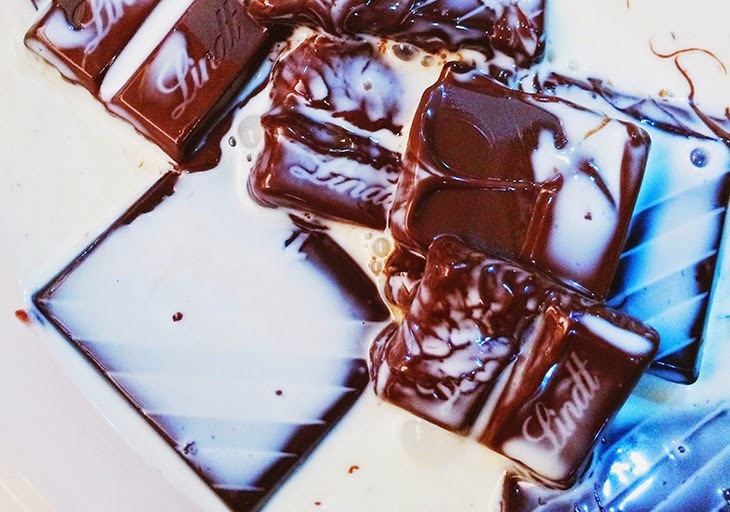 Whisk the butter and icing sugar until mixed, then add the extracts and dark chocolate. Continue to whisk until combined, then beat in the whipping cream. Pop the bowl into the fridge to allow it to solidify slightly while the cakes cool, but be sure to take it out before you fill the cakes to let it soften. Slice both cakes into three layers using a long serrated knife, then top each layer with the butter icing. Once all six layers are stacked, cover with ganache frosting in a happily haphazard manner. Top with fresh blackberries, or raspberries, or strawberries, or chocolate curls, or really anything you like. Enjoy with a cup of coffee. Also, you may have noticed that the look of the site has changed a little bit. In conjunction with my three-year anniversary, I’ve decided to give Ellebug a little treat! The new logo is care of the brilliant Zurisha over at Tinytype: Propfolio. Please go check out her stuff, order from her, just go talk to her. She’s lovely! Thanks so much, Sha, I’m completely smitten by the little ladybug B and the whole thing! So cute! So terribly, terribly cute! On a different note, is it smitten with, or smitten by? Couldn’t find a conclusive answer to this, and now I am legitimately worried I may have been making a mistake my whole life and will continue to make this mistake if I don’t find out!